Yes, the whole week was like this. All Cat wanted to do was take a seat on the bench and … this. Apparently accommodations at the Shrine of Seven Stars are only for humanoid shapes. And early in the week she had a horrible time with the shieldwall dailies. I don’t remember them hitting this hard, we almost died a couple of times. What’s up? She was doing them in her Safari Hat and instant Dalaran ring … oh. We’ve been stalking Kar Warmaker and I assume everyone but me has figured out how to avoid Cracking Blow because there’s never a sign of him. Finally! There he is! There’s no one on to call for help, so let’s try this! We tried the strafe around him approach and I think we went too fast and got hit. Didn’t matter though as we weren’t doing any damage at all. We shadowmelded and went to heal up and didn’t notice the crab … who killed us. So while returning for our body … AH HA … fishing pole equipped, could have something to do with the crappy damage and of course by the time we got back to old Kar he was dead. 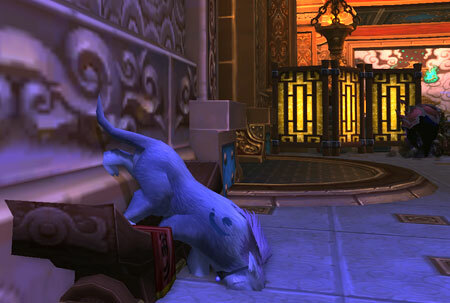 Oh well, let’s do some golden lotus dailies on the way to the Spirit Tamers. We finished killing the Crumbling Behemoth way down on the path, far away from the action and the phone rang. I moved off the path and left her in stealth. On returning I found someone fighting him on top of us and oops, we’re dead. So we fly over to the Shrine and try to repair but that Pera Firestone is too busy shooting off fireworks and running around like a nut to attend to us … sigh. Okay then, we’ll go beat up the Spirit Tamers … yeah … what could go wrong there. I don’t know about your team but my teams CAN NOT miss their big money spell two times in a fight and win. Miss … miss … miss. Then FINALLY we are about to win. We are going to win! We won, he’s dead! Noooo … then we died. I hate poison. Yup … that kind of week. So last night Amateur Azerothian whispered did I want to do OS25? Well yes I wanted to because I had missed the Laid Back Raid the night before because of poor reading comprehension but I was about to leave the house. Oh hell, let me see if I can make arrangements here, I want to go! So I did. Yes that’s me! 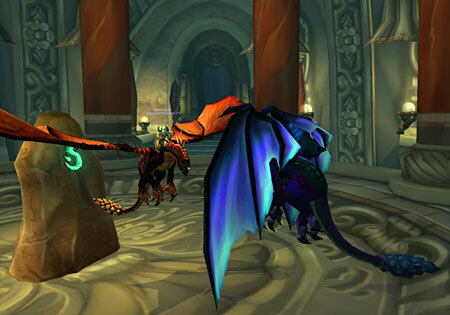 That’s me on that Twilight Drake! I’m pretty sure it was a set-up as I don’t win rolls, I usually roll an 8 or 11. We did it four times but were running out of alts to switch after a while. Thank you so much for a wonderful end to a crappy week! I’m going to start a new non-crappy week right now. Mounted on my Twilight Drake I’m going to roll up on those Spirit Tamers and astound them with my awesomeness, they won’t even see what hit them!